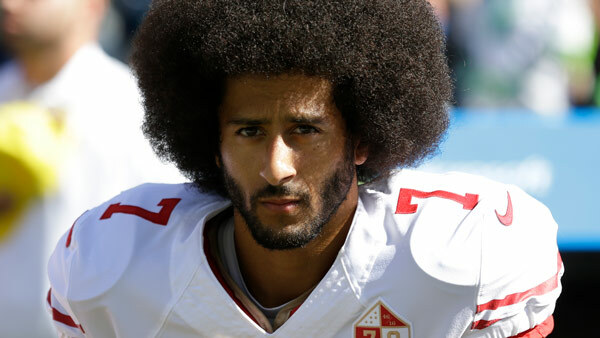 Colin Kaepernick has been named "Citizen of the Year" by GQ magazine, which published a feature story Monday about the former San Francisco 49ers quarterback and his emergence as a polarizing figure since his decision to protest during the national anthem. Kaepernick is not quoted in the story, titled "Colin Kaepernick Will Not Be Silenced." GQ states in the story that Kaepernick, who has rarely spoken publicly since becoming a free agent earlier this year, has "grown wise to the power of his silence." GQ also writes that Kaepernick agreed to participate in its project because "he wants to reclaim the narrative of his protest." The majority of the story consists of perspectives from people that GQ describes as Kaepernick's "closest confidants." "Colin also made it clear to us that he intended to remain silent," GQ states in the story. "As his public identity has begun to shift from football star to embattled activist, he has grown wise to the power of his silence. It has helped his story go around the world. It has even provoked the ire and ill temper of Donald Trump." Kaepernick tweeted Monday morning that he was "honored" to be recognized by GQ. Niners linebacker Eric Reid, who joined Kaepernick last year in his protest and has continued to kneel during the national anthem this season, was one of the individuals who spoke to GQ about his former teammate. "My goal this year has been to get the narrative back on track," Reid said. "We started having communications with the NFL, and they said they're going to help us make progress on these issues. But the next step is to get Colin back in the NFL. Because he's the one that started this. I think we're finally getting where me and Colin envision this going. Now it's time for him to get back in the league." GQ also published multiple recent photos of Kaepernick posing with people from Harlem, stating its hope to "connect him to a crusade that stretches back decades." Kaepernick, who led San Francisco to consecutive NFC Championship Games and one Super Bowl appearance, has remained unsigned since opting out of his contract with the 49ers in March. He filed a grievance last month that NFL owners colluded against him because of the protests, which are aimed at raising awareness of police brutality against African-Americans and other issues.